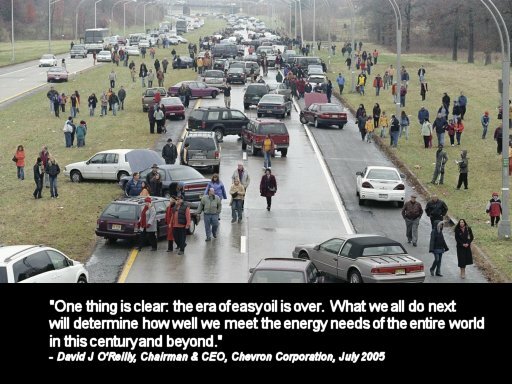 Cheap and abundant energy from oil is the foundation of modern technological civilization as well as essential to the neoliberal economic vision which is based on globalized production and consumption and the moving of resources and manufactured goods thousands of miles from point of production to point of sale. But world oil resources are finite, and as we hear in great detail, will begin to decline in the next few decades. This is widely acknowledged inside the oil industry, but is receiving no open attention in the public policy realm. Yet the implications of dwindling oil and soaring prices are staggering. This page was last modified on 3 September 2011, at 12:11. This page has been accessed 4,304 times.